When you ask in the interior of Colombia about the Department of San Andrés y Providencia, it seems that you are asking for a far away kingdom. Even some studies like this, refers to the islander department as a territory “very far from the national geography” (cf. Universidad de los Andes, destinos turísticos). Is it possible to say that a part of our sovereignty is “far from the national geography”? Is it not better that we are far from our national geography looking to it from the heights of our Andes? Would United States refers to the State of Hawaii as a territory out from the national geography? It is time to check our maps: San Andrés y Providencia does Colombia bigger than we think. 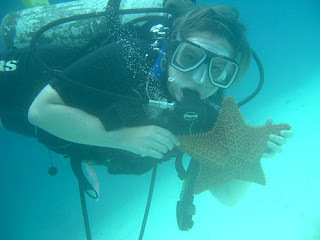 By Al Rodas | Picture “La estrella y yo” by Juana. Between two so far countries like Dominican Republic and Argentina there are only two countries: Brazil and Colombia. If we think maps just like lands – and of course lands are very important for population -, maps can be limited and boundaries are not specific. 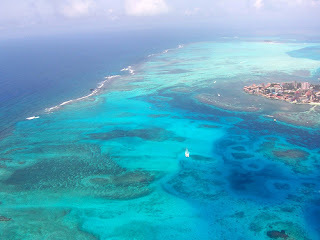 San Andres from the air by Harold58. When we include sea boundaries, the feature of countries can change radically the forms of what we have in mind. About Colombia few people think in a map that includes its sea territories although that part is almost as big as the Colombian lands. Countries give much importance to its sea possesions than we can imagine and many have gone to long wars trying to asure their flags on the seas. Luckely, Colombia as a nation was born with two oceans. However, in order to take an idea of how important is that fact for the country, we had to evolve from an Andean-base mentality to a strong national feeling of that every space of territory is our country and whatever happens over every single corner is a national concern. In this way, the Department of San Andrés y Provindencia is not “far” from Colombia, but it is Colombia. When we contemplate the map of Colombia including its sea possesions at both sides of the oceans, we relized things that in other way can be difficult to know. 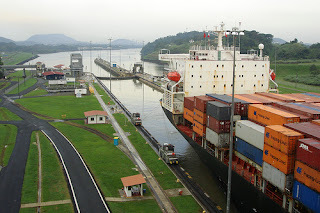 For example, that the Republic of Panama is practically sorrounded by Colombia, that the presence of Colombia in the Caribbean Sea is big enough to say that our country, being South American, is also Caribbean and Antillean and that we limit with countries we use not to thing often as our neighbours. The total area of the Department of San Andrés y Providencia is 57 kms sq. of its islander lands and 349.800 kms sq. in total, being the only department of Colombia with not continental area. Its capital is 290 kms away from the costs of Nicaragüa, 800 kms from Cartagena de Indias and 1800 kms from Bogotá. Due to San Andrés, Colombia has territory in the Antillean Sea and borders with Haiti, Dominican Republic, Jamaica, Honduras, Nicaragua, Costa Rica and Panama. It is also one of the biggest reefs of the Caribe and a natural reserve of great importance for the national and regional economy and inviroment. It was declared by UNESCO in 2001 “Biosphere Reserve”. The total population of the department is 48.838 of persons according with the reports of SISBEN 2007, 66.8% of them living in the city and 32.2% in rural areas. The Sanandresans, according with that very report, live in their majority under poverty, 69.9% of them, although it is one of the main tourist spots of the country. The Sanandresans have their own language different to Spanish, the Sanandresan Creole, the modern development of the mixture within Latin languages like Spanish and French with English and African languages. 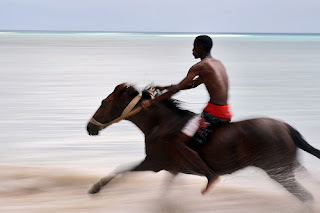 The language has connections also with the Creole of Haiti, Jamaica and the Antillas, but this one of San Andrés has its own particularities. It is also official in the territory of the department after the Constitution of 1991 that guarantee the protection of other languages spoken by minorities out of Spanish. Music, traditions and culture located the native Colombians of San Andrés y Provincia fully in the Antillean Caribe. The National University of Colombia has a local seat in the city and other institutions dedicated specially to prepare the youth for tourist services and protection of the ecological inviroment. Go with da wind. Picture by Julkastro. The city has also an airport with conection to the main centers like Barranquilla, Cartagena de Indias, Medellín, Cali and Bogotá and it is also possible to access to the the islands by sea from Cartagena and Barranquilla. 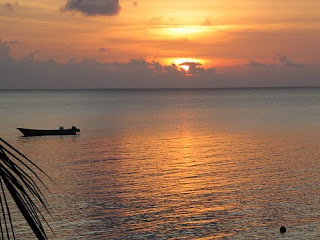 Providencia, the second municipality of the department and an island at the north of the biggest one, San Andrés, has also a local airport and Satena fights among the two islands. Migration from the continent, specially from Barranquilla and Cartagena and Arabs from the Middle East, have settled the islands during the last decades. 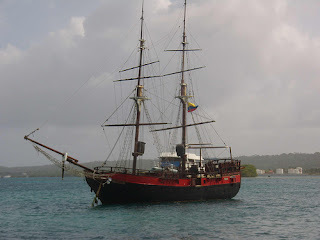 A ship in San Andres. By elielen. The history of the department could be a good script for a movie. It shares the history of the Caribbean settlements from Spaniards to English and French pirates. Although it was taken under the Spaniard sovereignty, the islands did not atract much attention to the conquerors who were busy with the vast continent territories. Then the first European settlements in the islands were English colonizers of Bermudas, Barbados, Saint Kitts and other places of the British Antillean. Dutch farmers, sailots, traders and pirates found in San Andrés their base and all together joined to fight the Spaniard Empire. The “Company of Adventurers of the City of Westminster for Plantation of the Islands of Providence or Catalina, Henrietta or Andrea and Adjacentislands Lying Upon the Coasts of America” was associated to this campaign on the noses of Spain. 1631 is marked also as the year of the arrival of the first ship with colonizers from Scotland and England at the board of the Seaflower and with them the first African slaves. Spain invaded the islands between 1641 and 1670 and the English and Scotish colonizers fled to other settlements in the Caribe. But Spain did forget again the islands and it became a center of operations to one of the most famous English pirates of the time: Henry Morgan with Edward Mansveldt. In 1786 there was an agreement that forced the English to leave the Spaniard territories of the Capitany of Guatemala, but many of them asked to remain promising to keep respect for the Spaniard Crown. In 1775 the Capitany of Guatemala named the Catholic Irishman Tomas O’Neille as the governor of the island with the mission to expel English and Dutch colonizers – something he did with a great pleasure, though he was not completely victorious. 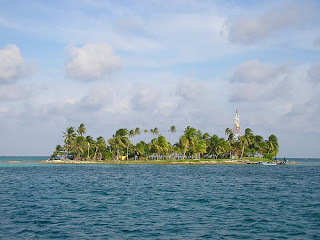 The port of San Andres. By Federico Quiroz. It was the time of the cotton plantations that came to be so much important and made to Spain even more interested. But 1788 the islands would start to have connection with a new authority: the New Granada Viceroyalty, when Antonio Caballero y Góngora allowed the islanders to commerce with Cartagena de Indias. In 1792 Spain accepted the stay of English and Scotish with the condition of loyalty to the Spaniard Crown and converstion to Catholicism, but Spain started a promotion of Spaniard settlement in the islands with not so much success. In 1803 the islands were integrated in the Vice-Royalty of New Granda. During the War of Independence, the islanders kep relations with the Spaniard goverment that settled in Panama and the English privateers returned to attack the islands, but this time to support the Independence of the Spaniard colonies, so in 1816 they invaded San Andrés and sacked it. But the man associated to the Independence in San Andrés y Providencia would be the French Luis Aury, a privateer loyal to Simon Bolívar that took the island and made it a fort against the Spaniards. With the visit of Luis Perú in the name of the Republican goverment of Gran Colombia, Aury signed the adhesion to the new South American Republic to raise the Colombian flag on June 23, 1822. Since then, the political life of the islands would be united to the Republican life of Colombia: Adhesion to the Constitution of Cucuta, 1822; adhesion to the Province of Cartagena de Indias, 1822 and the creation of the Intendence of San Andrés y Providencia, 1912. The sovereignity of Colombia in those territories included also the Coast of Mosquitos until the Binational Agreement in 1928 with Nicaragua where Colombia recognized the sovereignity of its brother country on Mosquitos and Nicaragua the sovereignity of Colombia on San Andres y Providencia islands. The agreement, called Esguerra-Barcenas was ratified in 1930. An island by nunca morir. Nicaragua said that the islands are on its continental platform. This argument, said the scholars, is not enough to claim for the territory of other country. If such argument were enough, many other countries could claim for many territories of others in their continental platforms. Moreover, the territory has never been in the Nicaraguan possesion. On the other hand, a study of the National Geographic and the National Colombian Army did a study of the islands’ geography concluding that they are in a submarine range independent from the continent. Other argument of Nicaragua is the legal validity of the Esguerra-Barcenas Meneses Agreement of 1928. It is said that the agreement was made in secret, that Nicaragua had at the time the presence of the USA’s mariners and that the country had not political independence that was only in 1979. To this argument, Colombia answered that the agreement was not made in secret and that there is not a reason to declare nutility of the document . The presence of the USA’s mariners was asked by the same Nicaraguan government to face the revolt of César Augusto Sandino and the Esguerra-Barcena Agreement was an independent act out of that situation. Nicaragua was already an independent state since 1838 and during the time argued by Nicaragua to declare nule the Agreement (1916-1979), the country celebrated 370 international agreements. If Esguerra-Barcena is not valid, those 370 agreements are not valid too. Other argument is that the Agreement violated the Nicaraguan constitution when it was affected its sovereignity. To this argument it is stated that the islands never have been in possesion of the Republic of Nicaragua. On the other hand, Colombia asked Nicaragua why to argue for a violation of the contitution if before it is argued that there were not independence. This unfamiliar form is actually the real and full territory of Colombia. The discussion for the Colombian islander territory started in 1980 when President Daniel Ortega of Nicaragua declared that the islands belong to his country. On December 6, 2001, Nicaragua made official a demand before the International Court of Justice of La Haya. On July 21, 2003 Colombia handed to the Court a full study of the situation to answer the claims of Nicaragua. Juridically, Colombia does grant nothing to what considers a full part of its national integrity. The sovereignity of Colombia on the islands came before Nicaragua was an independent republic and Colombia did not get it by force. If Nicaragua declared the agreement nule, the status quo before 1928 must be returned and it includes such a thing like the Mosquitos Coast should be returned to Colombia that was grant to Nicargua by Colombia in that agreement. The citizens of the islands joined freely the Constitution of Cucuta in 1822. In 1825 the Gual Molina Agreement between the Republic of Gran Colombia and the United Republics of Central America stablished that both states would respect the borders as they were at the moment of the Independence. 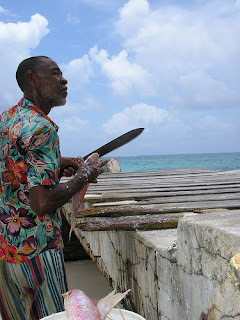 A Sanandresean fisherman. By nunca morir. 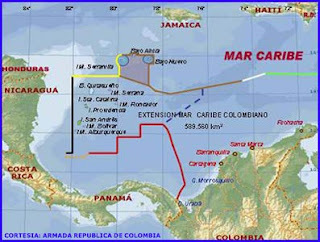 If our brother country claims for the islands, the Department of San Andrés y Providencia claims for Colombia. The islanders have been loyals to the Republic all their history, even if their culture is more near to what is Jamaica and the Afro-Antilles. San Andrés y Providencia is not “far from the national geography”. It is not a kind of “Colombian colony”, but it is a Colombian Department so much Colombian as the departments of Nariño, Huila or La Guajira. The point is that opening our country to international markets, we have to go united, recognizing our diferences and making of them a motor of development. San Andrés y Providencia could be in the Caribe just a great spot not only for tourism like is now, but also a great regional center for marine research, a spot for big universities able to attend students from the Caribbean countries and, specially, a place of friendship to our neighbours, even our dear Nicaragua brother that could see San Andrés not as a space of conflicts with their ancestral sibling, but the islands were both countries could join in peace to built best societies for our nations. The Department of San Andrés, Providencia and Santa Catalina. Map of the National Army of Colombia. Department of San Andrés y Providencia. Español internacional, Cuellar Molano Blogger. DIEK, Mariana. Criolística afrocolombiana. Universidad del Valle. Geografía humana de Colombia. Publicación del Instituto Colombiano de Antropología e Historia. Biblioteca Luís Ángel Arango. San Andrés y Providencia. Universidad de los Andes, Bogotá. Noticias de San Andrés. Radio Cadena Nacional de Colombia. San Andrés y Providencia Department. en.wikipedia. Una mirada social a San Andrés desde las cifras del Sisben. Boletines socioeconómicos. Departamento Administrativo de Planeación. Oficina de Información y Estadística. Departamento Archipiélago de San Andrés, Providencia y Santa Catalina, mayo de 2007. Document pdf. Universidad Nacional de Colombia, sede San Andrés. Pasan revista para el mejoramiento del turismo en San Andrés y Providencia. Satena. Ministerio de Comercio, Industria y Turismo. República de Colombia. Bogotá, 27 de julio de 2007. TRIBIN PIEDRAHITA, Guillermo. Nicaragua: velada amenaza de guerra a Colombia. Actualidad internacional y latinoamericana. La reclamación de Nicaragua sobre al archipiélago de San Andrés y Providencia y el mecanismo ante la Corte Internacional de Justicia de La Haya. Universidad Militar Nueva Granada e Instituto de Estudios Geoestratégicos. Bogotá, febrero de 2002. RODAS TORRES, Reinaldo Albeiro. Antillean Colombia. Colombia Passport: Economics, Society and Culture in Colombia. Sihanoukville, July 28, 2007.